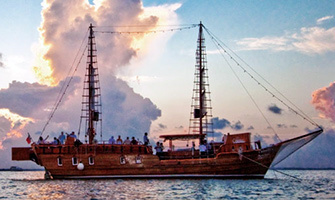 Columbus Lobster Dinner Cruise is one of Cancun’s most famous night tours. It is a tranquil trip through the romantic and mild waters of the Nichupte Lagoon on our Spanish Galleon Columbus. The trip has been especially planned to share magic moments with that loved person… the lagoon would never reveal the secrets kept in this trip as in the heart of each other. Delicious surf n’ turf or lobster dinnerwith the finest wine is completed with the sweet notes of a saxophone. 3 Dinner options: Surf n' Turf, Lobster, or Veggie Lovers vegetarian plate. All dinners include baked potato, vegetables & dessert. $6 USD per person dock fee. Transportation from Riviera Maya hotels can be added on for $15 per person round trip. For the 5:30 PM tour, transportation from the Riviera Maya is available every day. For the 8:30 PM tour, transportation from the Riviera Maya is available Tuesday, Thursday & Saturday.